Garnet is January’s Birthstone and comes in various colors and forms. 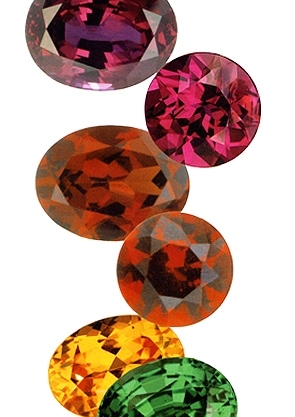 Below is a listing of different types of garnets. The garnet is highly rated for everyday wear, and is an affordable alternative to more expensive gemstones. Tsavorite Garnet is rich and intense with a refreshing surprise of verdant color. Its tones range from a light spring green to a deep breathtaking shade of forest green, making it one of the few gems to rival Emerald in color and beauty. Spessartite Garnet glows a spice-hued orange. It has all the warmth of summer melons, autumn leaves, and rich sunsets seen throughout all the seasons. Chrome Pyrope Garnet is an intense fiery red. With plum to reddish brown undertones it is sure to warm the heart. This gem is said to enhance understanding and meaning and is an ideal choice for those who seek clarity in their lives. Mozambique garnet is a glowing deep red with hints of orange and brown and it is the color that most people associate with Garnet. Wrapped in warmth, it reminds us of an autumn harvest or Indian summer. Rhodolite Garnet with shimmering brilliance and raspberry freshness has undertones of rose and plum. It immediately lifts the spirits with exuberant excitement and looks excellent in the spring and summer. Color Change Garnet is chameleon-like; the hues alter dramatically with a move from natural to artificial light. Shifting from stormy green to deep berry, this mystic gem reflects the changing mood of the wearer.